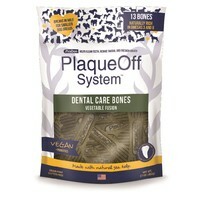 ProDen PlaqueOff Dental Care Bones Veggie Treats have been developed with natural sea kelp and algae to help clean teeth, reduce tartar and freshen breath. A 100% natural complement to your pet’s dental hygiene that they’ll love as an anytime reward, ProDen Veggie Treats are also a great source of omega 3 and 6 fatty acids for overall wellness and healthy inflammation. These were an excellent purchase and my Wire Fox Terriers loved them. One Dental care bone between two dogs was perfect. I do clean their teeth but these seem to make their teeth easier to clean with a better plaque removal.